An anti-Trump rally is being planned for this Saturday, November 19th, in Ocean Beach at noon. Folks from the Green Store and the OB Rag met and mapped out the event that will be held at the foot of Newport Avenue. As OB voted overwhelmingly against Trump, organizers hope to see some fellow OBceans on Saturday. 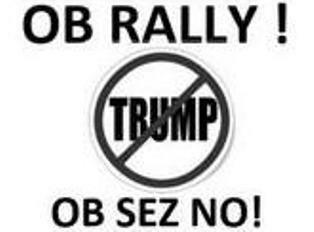 They want OB to join the wave of ‘No on Trump’ protests sweeping the country. A facebook event page is here. The protest is being planned as a peaceful, non-violent exercise of the First Amendment rights, but demonstrators are expected to be vocal. Supporters are asked to bring signs, chants, noise-makers and lots of spirit. For more info, call Rick at 619-717-7318.